Here is another spring wish list, but this time I'm sharing my top picks from Make Me Chic! 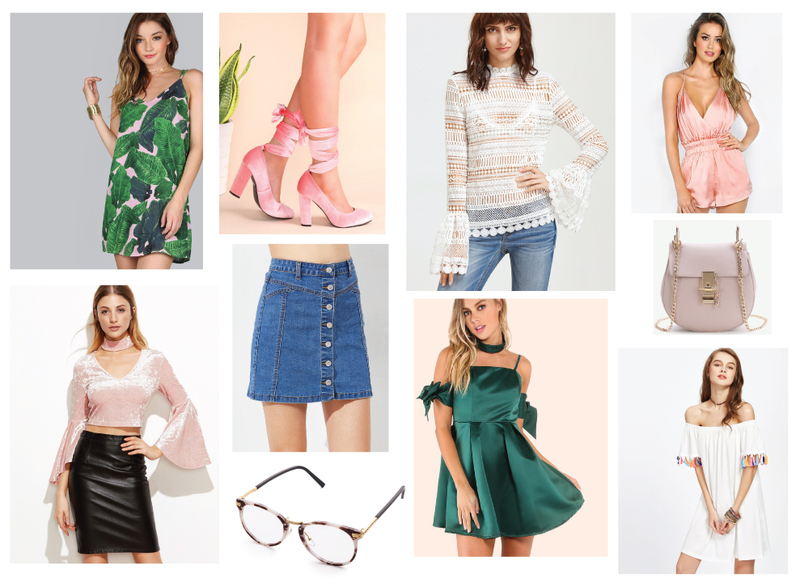 This site is comparable to Shein, but they have a more focused aesthetic and have lots of pretty things. I am totally obsessed with a lot of items from this site! I am definitely loving the pink and green hues from Make Me Chic. These pink velvet shoes and crop top are amazing, as well as the leaf print slip dress (perfect for spring!) I am also in love with this fit and flare deep green dress. I don't usually go for this shade, but it looks beautiful in this silhouette! I would also love to try the faux glasses trend with this adorable pair of specs. What is your favourite one? Let me know! That satin romper and those lace up shoes are amazing!! Aren't they so cute?! I want everything! Loving those lace up shoes gf!